Federal legislation has identified I-95 through Connecticut as High Priority Corridor 65. A long-term multibillion-dollar program to upgrade the entire length of I-95 through Connecticut has been underway since the mid-1990s and is expected to continue through at least 2020. Several miles of I-95 through Bridgeport were recently widened and brought up to Interstate standards. Work has shifted to reconstructing and widening 12 miles (19 km) of I-95 through New Haven, which includes replacing the Pearl Harbor Memorial Bridge. Environmental studies for reconstructing and widening 60 miles (97 km) of I-95 from New Haven to the Rhode Island state line are also progressing. ↑ 1.0 1.1 Staff (October 31, 2002). "Table 1: Main Routes of the Dwight D. Eisenhower National System of Interstate and Defense Highways as of December 31, 2017". Route Log and Finder List. Federal Highway Administration. Retrieved October 22, 2018. ↑ Samuel, Peter (March 30, 2010). "North Carolina tolling I-95 being studied". TOLLROADSnews. Retrieved August 20, 2010. ↑ Virginia Department of Transportation (February 3, 2009). 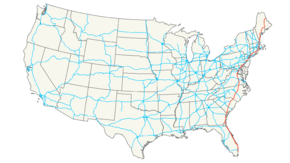 "Five States and USDOT Partner to Improve Interstate 95 Through Corridor of the Future Program: Development Agreement Aims to Reduce Congestion, Increase Safety and Reliability". Press release. Archived from the original on February 11, 2009. https://web.archive.org/web/20090211041724/http://virginiadot.org/news/statewide/2009/five_states_and_usdot38435.asp. ↑ "Aroostook Delegation Pushes for I-95 Extension". Bangor Daily News. April 10, 2009. Retrieved January 29, 2013. This page was last changed on 7 February 2019, at 14:45.